When I was buying the house that is now our home, my younger daughter, Jasmine (who was 10 at the time), fell in love with a large wooden pair of eye-glasses that was on display on the wall in the model house. She wanted a pair of glasses just like that for her new bedroom. It turns out that the glasses in the model house came from PBTeen. Well, PBTeen move over, because Meaning of Life Designs now has something much better! Introducing The Spectacle-R View. If you say it fast enough, it sounds just like The Spectacular View! Create your own Spectacle-R View as a quilt with a background (72" x 32" - this one's for me!) or create it as a free-standing pair of eye-glasses to hang on the wall (64" x 19.5" - that one's for Jasmine!). 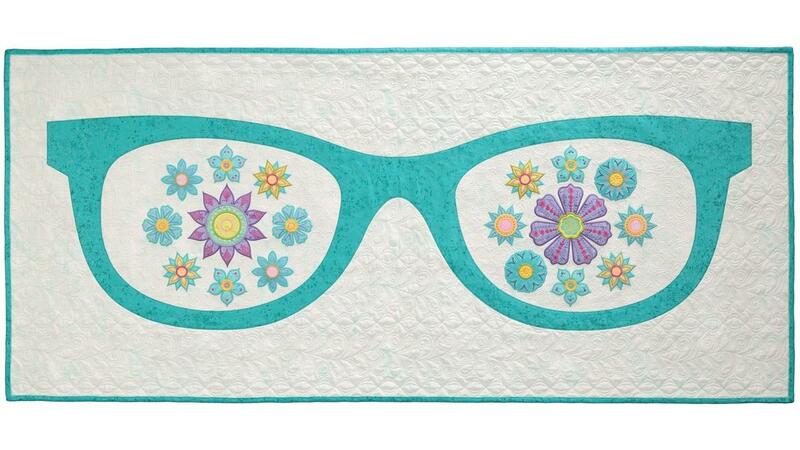 The Spectacle-R View is a fun project that brings a splash of happy and a drop of Spring into your home. Featuring designs from Petal Power 4i and Petal Power 8i, it can be customized using your favorites from these two design collections.